"We know that from the roof comes hate! The liquid death! Creeping destroyer of we Optera. Yet you stand upright. We will consult the chasm of lights and if you come from above, you will die!" 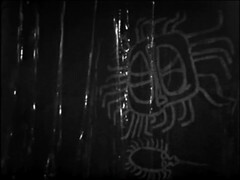 Vrestin & Ian find themselves in tunnels with cave paintings on the walls. They are swiftly surrounded by an alien race different from the ones we've seen so far. At the Crater of Needles Barbara and the de-winged Hrostar labour with man other captured Menoptera. Barbara is suffering in the thin atmosphere. The work they are doing provides the Carsinome with the raw material to grow. Hrostar tells Barbara that the invasion force is due to arrive soon. 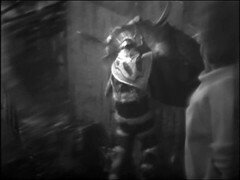 Communicating with the Animus the Doctor bargains for Vicki's life, he then starts to plan their escapes an alarm sounds. The Zarbi at the crater of needles round their prisoners up. Ian & Vrestin are captured by the lice like Optera. The Optera are being poisoned by the material the Zarbi are using to build the Carsinome which is penetrating into their underground dwelling. 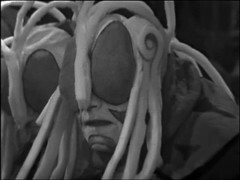 The captured Menoptera ask Barbara is her friends could be helping the Animus and have given away the invasion force. They worry that the invasion force will be massacred. They plot an escape from the crater to warn them. One of the Menoptera believes he can disabled the Larvae Guns. The Doctor examines the Animus' device which was used to immobilize Vicki: it's made of gold like Ian's pen which disappeared. The slaves overturn their remaining Zarbi guard and kill the Larvae gun by crushing it's underside against a wall. 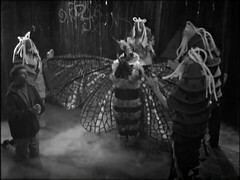 The Doctor immobilises the Zarbi control device, but the Zarbi & Animus overhear a transmission the Doctor was monitoring and discover where the Menoptera are due to land. The Optera believe Vrestin & Ian have come to invade, but Vrestin tells them that her people have come to free them. Ian deduces and explains that the Menoptera and Optera are a related species. The Optera are amazed at Vrestin's wings: they believe the Menoptera are their gods. The Menoptera invasion force arrives. Vrestin tries to warn them but the Zarbi attack. The Menoptera find their weapons useless against the Larvae grubs and many are killed. Barbara and Hrostar attempt to escape but are surrounded by Zarbi. Not bad again, this story has picked up after a poor first episodes. 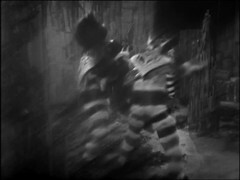 Six parters can be a difficult story length for Doctor Who. Here writer Bill Struton gives the story a boost by introducing the Invasion Force, which we were expecting, and a new alien race living under the surface of Vortis. I like the way the costume designer has made the Optera costumes look similar in certain ways to the Menoptera costumes. When you think about it you can tell they're related species. There's a nice touch in the tunnels where a modified version of the repeating musical theme we've heard on the surface is played, another part of Rapsody de Budapest by Les Structures Sonores which you can hear a clip from it at iTunes or Amazon. The Kirby wire landing of the Menoptera Invasion force worked quite well too. BARBARA: Are your wings healed? HROSTAR: I shall never fly again. BARBARA: Why do they make us heap this vegetation into the acid streams? HROSTAR: It is the raw material for the Carsinome, where the Zarbi live. Fed into these pools, it is drawn to the centre through underground streams, and as we pour it in, the Carsinome grows and reaches out across Vortis. BARBARA: Well, what lies at the centre? HROSTAR: None of us have ever seen it and lived, but we call it the Animus. BARBARA: Do you understand them? HROSTAR: No. They are just cattle. They do not have any speech nor motive of their own. Just controlled sentries. We came here to liberate them. It was disaster. Vrestin, the others, we arrived in advance of the spearhead. Our weapons proved useless. They were taken by the Zarbi who were everywhere. The three of us you met in the cave got away with the communicator, but we could not contact our spearhead. BARBARA: Well, when is it due to arrive? BARBARA: And how will you overcome the Animus? HROSTAR: With a new invention of our scientists. It has not been tested but we have placed our faith in the Isop-tope. The battle sequence, as the menoptera escape the crater is a little bloodthirsty as first a Zarbi is knifed with crystal shards and then a Venom Grub is squashed against a rock wall! 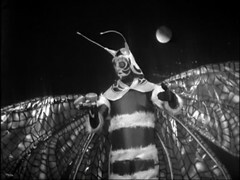 Making his Television debut is Martin Jarvis as Hilio, the Captain of the Menoptera Invasion Force. His long acting career brings him back to televised Doctor Who twice as Butler in Invasion of the Dinosaurs and the Governor in Vengeance on Varos. He also appears in the Big Finish audio drama Jubilee, the inspiration behind the new series episode Dalek, with his wife Rosalind Ayres who is, to the best of my knowledge, no relation to me! Playing Hetra is Ian Thompson who like Roslyn de Winter (Vrestin) and Arne Gordon (Hrostar) is reused by Director Richard Martin in the Chase. He appears in episode 2 The Death of Time as Malsan. He also appears in the Blake's 7 episode Breakdown as Farren. The other speaking Optera is Nemini played by Barbara Joss .